Home » Galleries » Past Shows » 2008-2009 » Outdoor Sculpture » "Meridian II"
In the mid 1990s McCullough began work on the Meridian series of ten sculptures, based in part on his experiences at sea in the Navy. The Meridian sculptures are constructed primarily from stainless steel and are characterized by an elegant relationship of abstract forms that fold into and expand out of themselves in an evolving pattern of shifting light, cast shadows, and reflected colors from the environment. Meridian II was created in 1997 by Ed McCullough at his studio in Cissna Park, Illinois. It was fabricated in stainless steel and weighs approximately sixteen hundred pounds. Stainless steel anchors fabricated by the artist affix the piece to a dark, concrete pad whose color accentuates the bright, reflective qualities of the stainless steel sculpture. Meridian II is located in front of the Center for the Arts, where its crisp geometry and surface qualities echo and compliment the contemporary sensibility of the building’s design. Meridian II was premiered at the Pier Walk exhibition held at Chicago’s Navy Pier in 1997, then exhibited at the South Bend Regional Airport where it was leased for two years. 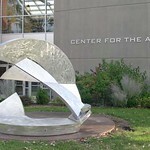 In 2008 it came to Luther College from Indiana State University at Terre Haute, IN, where it had been exhibited on loan since 2003. 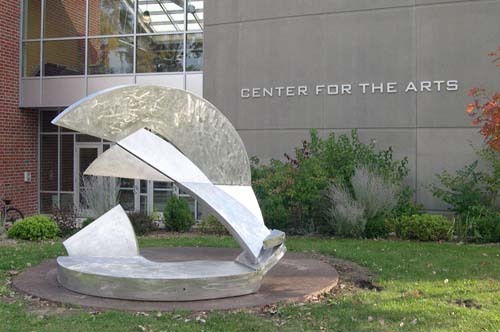 The sculpture was donated to Luther College by the artist. During the dedication speech by the artist, he said, “The Meridian sculptures are grounded at a place, and they’re also airborne — the forms that define open spaces also release themselves and their spaces upward and then . . . bring it all back again, you with it. Everything therein is connected to everything else; inseparability, meridian.” Other works from the Meridian Series can be found at the McLean County Arts Center and the Central Illinois Regional Airport, Bloomington, IL; the Admiral Michael Boorda Memorial in Momence, IL; the Unified Public Schools, Watertown, WI; Dominican University, River Forest, IL; Kankakee Community College, Kankakee, IL; Eastern Illinois University, Charleston IL; and the Chicago Police Headquarters Building.